With over $3,000,000 in recorded lifetime earnings and a pair of World Series of Poker Circuit rings, Czech Republic poker pro Martin Kabrhel has had much to celebrate in his extensive poker career. 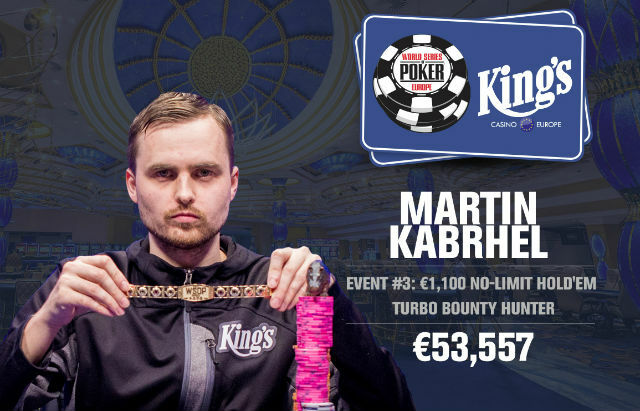 On early Thursday morning though Kabrhel reached a new high as he emerged victorious in the WSOPE Event #3 (€1,100 Super Bounty Turbo) on his home turf of the King’s Casino in Rozvadov for €53,557 and his first WSOP gold bracelet. The one-day turbo tournament featured a healthy 325-entry turnout (92 re-entries) and a prize pool of over €214,000. With 20-minute levels and every player carrying a €300 bounty, bustouts were fast and furious throughout the day as the field looked to accumulate enough to take a seat at the final table. Plenty of notable names made the money but fell along the wayside including Kristen Bicknell (32nd), Brandon Cantu (24th), Felipe Ramos (23rd), 14-time WSOP bracelet winner Phil Hellmuth (11th) and Mike Leah (10th) who was knocked out by Kabrhel to bubble the final table. Additionally, current World Series of Poker Player of the Year points leader Chris Ferguson (36th) notched another cash to extend his current lead for the award. Kabrhel had a rocky start to the final table, relinquishing the chip lead for a short amount of time on a failed bluff, but would find his back in control by hunting down his fellow tablemates and putting together a string of knockouts that would take him to the winner’s photo. After the elimination of Viktor Kovachev (9th) and Georgios Koliofotis (8th), Kabrhel would call and cover the short stack shove of Bernd Gleissner. Gleissner, all in and behind holding against Kabrhel’s found no help on the runout and Gleissner fell in seventh. The newly married former November Niner, John Racener, who is looking to gain ground on Ferguson in the WSOP Player of the Year race, was the next to fall to Kabrhel. In fact, he and Yves Kupfermunz would bow out on the same hand. Kupfermunz shoved his suited and Racener, who was covered, called off with . When it came around to Kabrhel in the big blind, with the chance for the double knockout, also called holding . Though Racener had the best of it preflop by a small margin, the flop ran out , putting Kabrhel way in front. The case turned, drawing Racener dead and with only three outs left, Kupfermunz’s bracelet quest ended in fifth place with the river . Racener’s sixth place finish, helped him surge to thrid position on the Player Of The Year leaderboard, now only roughly 50 points behind Ferguson. Only three hands later Kabrhel was at it again. After raising with Kabrhel was shoved on by Liran Twito who held . Kabrhel snap-calls and while the duo paired their queens, Twito’s kicker problems put him on the rail in fourth. Salvatore Camarda later found himself entangled in a pot with Kabrhel. In the big blind three-handed Carmarda held on a flop. Bottom pair though was not good enough as the red-hot Kabrhel had the in the hole. After they checked around, the turned and Kabrhel had yet another opponent drawing dead. Camarda proceeded to get all of his chips in on the next two streets, finishing in third. The first seven eliminations at the final table took all of 31 hands. The heads-up battle between Kabrhel and Germany’s Philipp Caranica would take another 58 more. The back and forth battle saw a number of lead changes as both battled for the bracelet. Early in the morning, the first hand after a break, the end finally came as the chip leader Kabrhel and Caranica put all the chips in the middle preflop . Caranica slightly ahead, holding the suited was up against Kabrhel’s . A fortuitous runout of brought in the double-gutter backdoor straight draw for Kabrhel, awarding him his seventh knockout of the final table and his first WSOP bracelet.